London, England – Indoor rock climbing was born in England, which makes sense when you consider the fact that England has produced more legendary mountaineers than basically anywhere else, and that’s without any Yosemite/Eiger/Teton/Cordillera Paine/MontBlanc storied climbing meccas (Ben Nevis being the exception, though an argument can be made that it’s iconic because of all the climbers who trained on it instead of vice versa). Though Scotland and even parts of England proper (Bristol in the house) have some decent crags (fun, at least when it’s not raining…), so does Chattanooga and yet Tennessee hasn’t produced a Whillans, Bonington, Boardman, Tasker, etc… So on a recent trip to London, I had to get out of the normal family trip grind of restaurants and shopping and Harry Potter mania old-building-gaping to check out the indoor rock scene. With family in tow, I found myself at the Arch Climbing’s (https://www.archclimbingwall.com/ ) Building One Location. London Climbing Gym, London Kids are Climbing Up, and up. The place was packed, especially for 1 in the afternoon on a Friday. Kids. Older balding kids (like me). Legit old-timers. People on dates. People on lunch breaks. Collegiates after school. Professionals after work. It was a scene, more than most climbing gyms I’ve been to stateside (and no, I’ve never been to Brooklyn Boulder). I mean, really a scene — 5 people standing around for everyone climbing, a cafe with a few tables to hang out and every table taken up by folks chatting over Americanos. A shop. 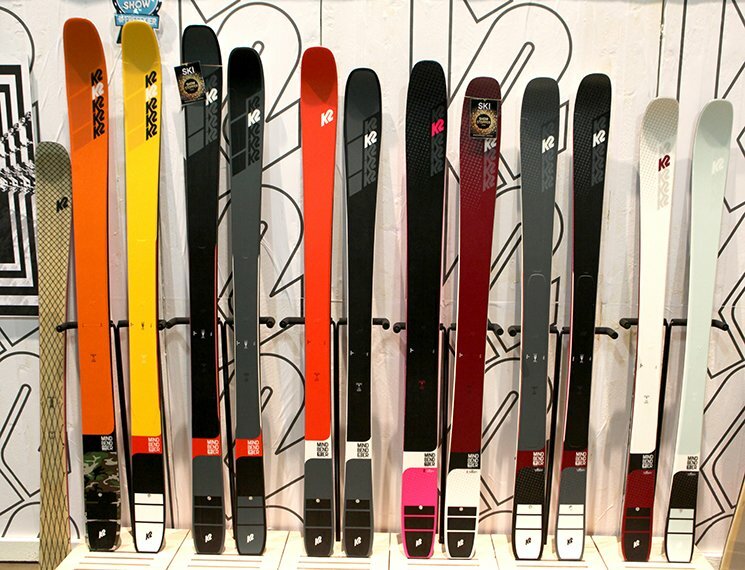 And just good vibes, good social gathering, no egos, no climbing bros getting aggro over how cool they look on plastic holds. And obviously, it had some really fun, varied climbing. Arch Climbing Wall: Building One is like a bouldering Wonderland. You look in the window and it looks okay – but then you enter and the rabbit hole goes so deep. Walk in, take a quick little test about basic climbing safety (e.g. 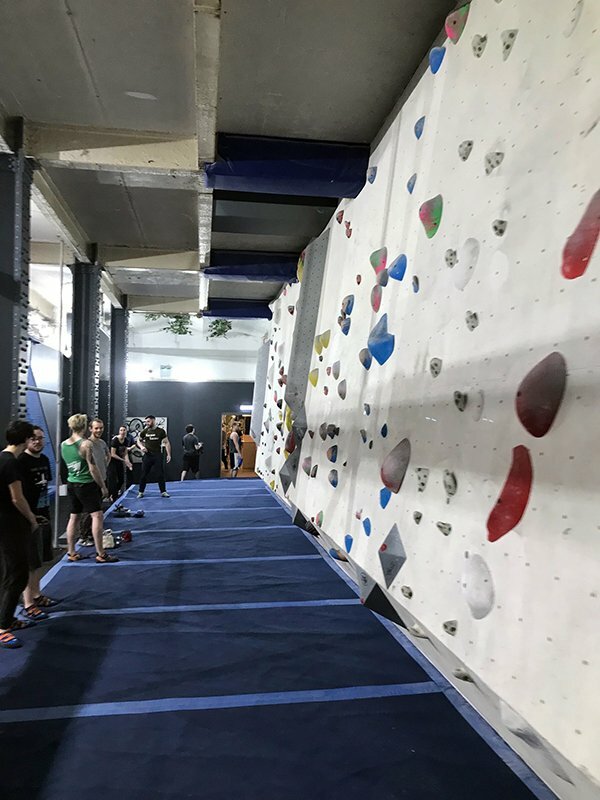 the guy at the front desk showed me a picture of a guy standing underneath another who was bouldering and asked me what was dangerous in the picture), and then you’re in the first room, with a wall in the middle of varying angles. Pass the shop and cafe on your left into another room with a two-sided wall and strengthening section on your right — pull-up bars, rings, weights, hang boards, so on. Then turn a corner to pass a u-shape corridor set up with a traverse route. Next, there’s a cavernous room with seemingly endless angle and hold options. Having fun on overhangs. Fun jug side pulls and down to little crimps. I lapped the room, went back and lapped the traverse, then back into the cavern room and worked it hard. Back to the first room. Back to the middle room. For an hour I climbed basically everything I wanted to climb despite the crowd. Never felt intimidated by some rock goddess throwing shade at the mortals (actually saw a lot of people who seemed to be climbing for the first time). Never had anybody going, “Hey bro, I was eyeing that wall you’re on.” And I walked back out with a good sweat, muscles twitching, stretched, and all around feeling better physically than I’ve almost ever felt on an urban vacation. 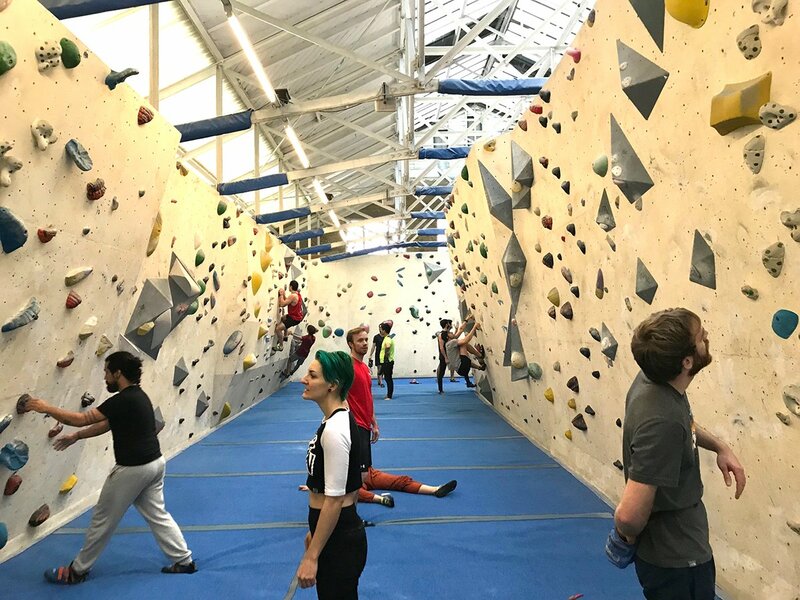 Now next time I gotta check out one of their other locations (North, https://www.archclimbingwall.com/north-centre-info, and Acton, https://www.archclimbingwall.com/acton-centre-info ), as well as a few other spots in London because man, were the vibes great. I kinda chose the spot because it was one of the closer climbing gyms to where I was staying by Tower Bridge, though I also did some research and dug the history of Arch Climbing (originally founded on an old Victorian arch underneath London Bridge, now the fastest-growing climbing company in the UK http://www.climbingbusinessjournal.com/what-it-took-to-make-uks-fastest-growing-climbing-gym/) . We crossed Tower Bridge, walked away from the touristy section into the neighborhood of Southwark, past townhomes and schools and stray cats and young’uns giggling with accents. I finally found it tucked into a former factory courtyard, with a bunch of hot shops and food spots, that beautiful reinvention of aging husks that is IMHO possibly the greatest trend in the urban landscape. The official address is 121 Drummond Rd, London SE16 2JY, UK. 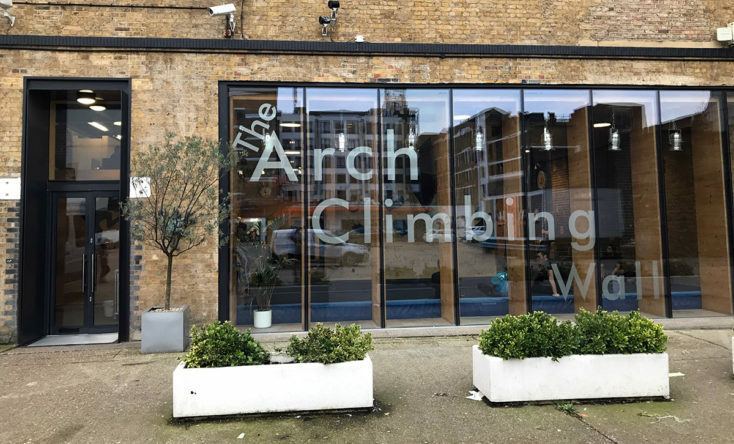 Next time you’re in London and you’ve had enough touring around and fish and chips and just need to get that sweaty meditative pumpy fulfillment that only comes from physical exertion and, especially, from a good hard climb, check out the folks at Arch Climbing (https://www.archclimbingwall.com/). With 3 spots, no doubt that got one close enough.